The basics of my hybrid 2-channel/HT setup are now in place, and working pretty much as I had hoped. This system will most likely stay in this configuration for a while. Next upgrade steps will probably be power cables (I did run two dedicated 20-amp lines), power conditioning, and possibly speaker cable/IC upgrades. The subwoofer is also probably not my endgame solution. 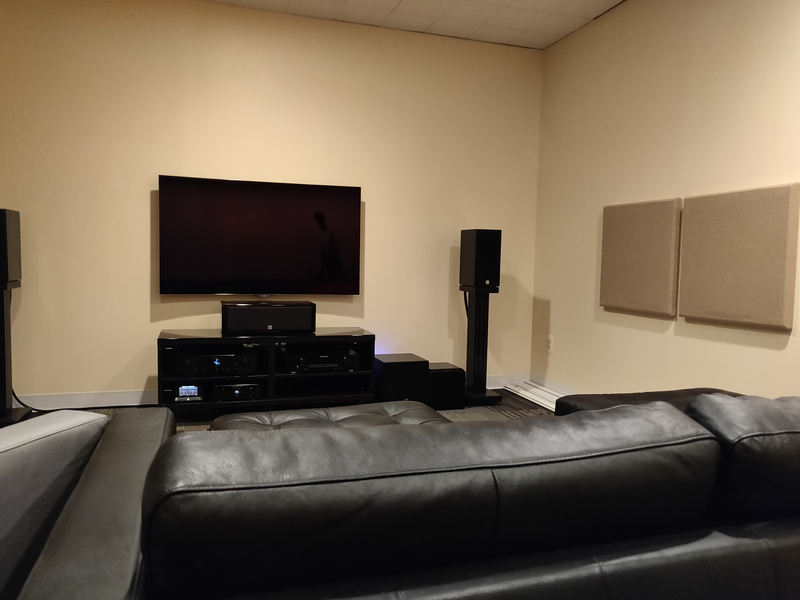 Since I have it connected via speaker-level inputs (because the VA bookshelves could use a little help in 2-channel operation), my HT is actually 5.0, with all speakers running large. I'm assuming that without a sub, the AVR sends the LFE output to the L&R main channels, which are tied to the sub (crossover set manually with the sub's dial). So... I don’t feel like I’m losing any performance there. Please enlighten me if I’m wrong. I do feel that this sub is an excellent performer for HT, but not necessarily as musical as I'd like it to be, so I'll be on the lookout for something else at some point. Overall, this is the finest sound I’ve ever had in my home. I’m very pleased! My only gripes? The Marantz integrated can only switch between modes by pressing a button on the front panel and holding for 3 seconds. There's no way to do this remotely. So yeah, I have to get up to do that. I’ve been making sure to leave it in HT mode, since I'm the only one who uses it for music. Funny thing is, if I forget and leave it in 2-channel mode, anyone who wants to watch TV only hears the center channel and surrounds, and they usually don't even notice! Also, Marantz chose to use the same remote control codes for power on/off and volume for the integrated amp and the AVR. I use a Harmony remote, but it’s basically only good for HT operations. I don’t use it for 2-channel use, since it also powers on the AVR unnecessarily. how about trying Signal Cable Silver Resolution from dac to amp? 30 day home try out. I'm not sure Signal Cable is where I'll end up. I want to listen for a while and think about my options. What improvements/changes do you think I'd see with the Silver Resolution vs the Analog Two? I put a couple panels up last week to manage reflections on the right side. Left side is open to a larger area. I think it was successful as things seem more stable, centered, and balanced now. Anyhow, I really like where things have gone with the Wireworld power cables and speakers cables. Glad I made that investment. If I upgrade any more power cables, I guess it would be the subwoofer PC. The stock cable looks fairly basic and smallish. I really don't care about the HT PCs. 2-channel ICs and a digital coaxial cable will be likely be the next, and close to final, upgrades. Gotta be Wireworld at this point. Oh yeah, and even though HT is not really a priority, I'd like to upgrade that center channel speaker cable. What length cable you need for the center? I had Doug make a custom cable for me, but I no longer have an HT. It's bi-wire on both ends (but I didn't use the amp end bi-wired), but it's pretty short...maybe .5m. Shoot me a pm if you'd like more info. I'd let it go fairly cheap to a good member since it's just sitting in my closet. Actually have a great center and surrounds that I need to list for sale. @PSOVLSK Gotta love this place! Post a need and someone offers to help. You see it all the time. That cable sounds good, except for the bi-wire part. I'm going to hold off for the moment, since my center is not bi-wireable. Of course, @DSkip talked me into some bi-wire cables for my mains (same posts), but the Wireworld ends are interchangeable and we did bananas/spades on the bi-wire speaker end, and the amp end has just a single pair of spades. I'd prefer to make this connection simpler. Yeah, I had it custom made along with a pair for the front speakers. I shouldn't have gotten the center cable bi-wired, at least not on the amp end. Not one of my better decisions, but luckily I was able to make it work. I really hate that I no longer have an HT in which to use the cable. First time in about 20 years I haven't had an HT with a center and surround sound. I miss it. Great looking system(s) you've put together. Best of both worlds! Wireworld also allows purchases of single cables if that is what is needed. They sell in pairs because that is the most common need by a long shot. I think I have a short single of the helicon OCC somewhere. Found it quick. It’s 6’ with bananas all around. Thanks! It's really coming together nicely. I've heard better, but not in my own home. Shouldn't I have asked you about this a week or two ago? ?